Yummy Yummy - but good for your horse's tummy? I often see articles and posts on various horse groups encouraging the feeding of fresh fruits and veggies to your horse. Many think this provides an oft times missing link to "live" foods that many hay fed horses miss out on. But is this really a good practice? I scoured the internet - well, I went through the first 3 or 4 pages of related search arguments about safety of fruits, veggies and greens for our horses - and came up with a lot of comments, lists and opinions but not one which was documented and referenced. This downloadable pdf can be printed and stored in your feed room or kitchen - or wherever you might prepare fresh snacks for your horses. While a few of the veggies listed in the "Avoid" group are considered "safe" in small amounts by some fresh veggie advocates, knowing that experts in toxicology consider them potentially poisonous for horses would have me leery of even considering them. But the list of yummy things your horse can enjoy is long enough that the "avoids" certainly won't be missed. where Dreamer thinks she heard someone say "Strawberries for dessert? Yum!" In Sunday's article Allergic Skin Reactions - a nutritional approach I tried to keep the focus on how you could support your horse nutritionally to lessen (or even eliminate) exaggerated skin reactions. Today I'd like to add some soothing recipes that others have shared. Owner's oatmeal shampoo recipe has been requested. It is as follows: 1 cup ground up oatmeal (turn to flour consistency), 2/3 cup baking soda, 3 cups warm water, 2 tablespoons aloe gel (optional), 4 drops lavendar extract (optional). Leave on itchy areas for 5 minutes. 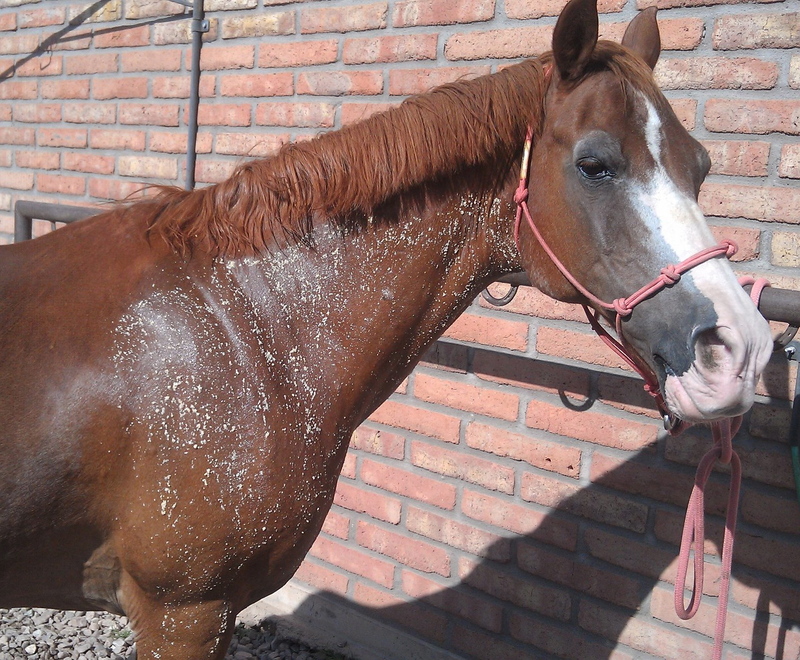 If you don't want your horse to have little oatmeal chunks on him/her strain the shampoo through cheesecloth. Otherwise just do your best to rinse off the little oatmeal pieces. To help get it out of the mane, spray with a hose and brush simultaneously. Marsden obviously gives his stamp of approval. Some other timely recipes can be found at Desert Horse Equestrian Services - the website of wholistic horse and rider biomechanics coach and horse rehabber Stacey Kollman. Fill a gallon container about 3/4 full of water. Add 1 cup vinegar (apple cider or white), 1/2 cup Dawn dishsoap and 20 drops of the following essential oils: peppermint, eucalyptus, tea tree, citronella. Top off with water as needed to fill the container. Shake well. Store airtight and out of direct sunlight. Variations: if you're having big problems with flies, you can "power up" the spray by doubling the amount of peppermint; same for mosquitoes/gnats by doubling the citronella. (Be sure you're using 100 percent pure essential oils, not synthetic "fragrance" oils.) I know some folks are concerned about using citronella after hearing it attracts bees, but I haven't had any problem with that either in Arizona or Colorado, both places where you can find Africanized bees. This is a variation on a recipe developed by the manager of one of the elite Kentucky thoroughbred breeding facilities for use on broodmares and foals. In my experience, it has safely been used on horses of all ages, humans of all ages (even those with chemical sensitivities), dogs, raptors at a wildlife rehab center and a herd of organically raised yaks! Still, use caution the first time you use it and apply to a small area at first to gauge sensitivity. Click here for a full menu of Stacey's Natural Horse Care Recipes. One of my favorites has always been to add a few drops of Tea Tree essential oil to vitamin E oil. Add four to six drops of Tea Tree oil to about one half cup of vitamin E oil - the aroma should be pleasantly obvious but not overpowering. 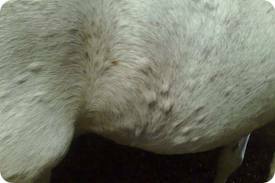 You can also use Benadryl (diphenhydramine) cream or hydrocortisone cream on itchy spots but avoid getting the cream on any open areas your horse may have rubbed. If your veterinarian has prescribed an oral antihistamine or steroid, check with her before using one of these topically. ~ where the monsoon brings us toxic Colorado river toads and a huge array of new bugs. Does the arrival of summer herald an outbreak of hives? Or does your horse try to rub her chest or ears raw? Does your horse look like a war horse - covered in mesh protective blankets, sock and face masks? Are Tri-Hist and prednisolone part of your horse's everyday diet? And finally, does she try to hide when she sees you coming with a spray bottle of the latest chemical or natural repellent? There may be some help in the feed bucket - not some magic bullet but some common sense basics with tried and true track records - thanks to the teachings of Equine Nutritionist Eleanor Kellon, VMD. Allergic Skin Reactions - a nutritional approach is a handout I put together for some clients and friends to help them understand how to support their horse's immune system and lessen the severity of their horse's inflammatory reactions to bug bites and other "allergy" responses. "Once an inflammatory cascade is started it seems more and more things will act as triggers until our horse is in a bubble of inflammation - with many systems affected. It can take something fairly significant (such as steroids and antihistamines) in large enough doses taken for a long enough period of time to stop the inflammatory response spiral and hold it off long enough for the immune system to regroup. If we don't get a handle on inflammation, our horses will start to react to "everything" - this is what we often see when horses are given allergy tests (not particularly reliable) and they respond as "allergic" to every hay, feed and other things they encounter in their environment." Processing Feed Ingredients - the lead article in the July issue of Dr. Eleanor Kellon's The Horse's Mouth can give you some insight on reasons to include - or not include - processed feeds for your horse. I've long been a fan of using "straights" or "hard feed" - grain with as little handling and processing as possible but there are many circumstances where your horse might benefit from the improved energy availability of a processed grain. An eye opener in Electrolyte Replacement is that low potassium may actually reflect inadequate sodium (salt) intake. Most "pleasure" horses don't need commercial electrolytes but would benefit from making sure their daily requirements for salt are being met - which they won't get from a salt block. In the Southwest, where the dry air can cause a horse's sweat to dry up before it's noticed that the horse is sweating, an average size horse should be getting two to three ounces of plain white salt a day. Veterinarian Lisa Lancaster of Lancaster Veterinary Services in Denver, CO explores the effectiveness of acupuncture in Equine Acupuncture, especially as an adjunct to treating pain and inflammation. As we see more veterinarians learning and practicing alternative modalities themselves or referring their clients to Integrative Medicine practitioners, it's important that we have some understanding of these modalities so we know what to look for and what to expect. If you haven't looked into subscribing to The Horse's Mouth, you'll find it's a bargain. Your monthly downloaded pdf issue will become a resource that you'll return to over and over again. A subscription will give you access to past issues plus the opportunity to "Ask the Vet" - pose questions directly to Dr. Kellon in an international discussion forum. Subscribe to The Horse's Mouth here and check out the Equine Nutrition course offerings. More information about the alternative modalities Dr. Lancaster practices.